Find hotel near Sulbing (saling) Korean T ..
Open daily for 24 hours, Sulbing (Saling) Korean Town Bangkok is Korean style desert café that was started in 2015. This café serves some of the best deserts in town and is a great place to meet and socialize with your family and friends. The portions served are huge and bingsu ice that comes with the deserts will melt in your mouth instantly. Here at the café, plenty of parking is available. 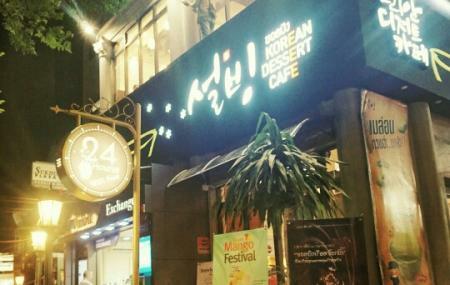 A few must try delicacies here are Sulbing mango cheese, Strawberry ice flake dessert, and cheesy rice cake. Sulbing (Saling) Korean Town Bangkok is not a popular tourist spot and visitors exploring prime attractions like Wat Pho Reclining Buddha, B T S Skytrain, Rajawongse Clothier, Grand Palace and Wat Phra Kaew. For more popular attractions visit things to do in Bangkok. You won't miss your home when in Bangkok, hotels in Bangkok like Aim House Bangkok, Pas Cher Hotel De Bangkok, Ibis Bangkok Riverside and Kokotel Bangkok Surawong offer some of the best places to stay in the city. How popular is Sulbing (saling) Korean Town Bangkok? People normally club together Suan Pakkad Palace Museum and Temple Of Dawn while planning their visit to Sulbing (saling) Korean Town Bangkok. People also prefer to start their day with Sulbing (saling) Korean Town Bangkok. Ordered Chocolate and Strawberry Bingsu, love them both. Strawberry is quite sweet but if you eat with ice-milk, it goes together very well. But without the condensed milk, the whole thing would be too bland, condensed milk really does help. I hope they would give me more of this, one condensed milk cup per 2 bingsu is not enough. Love the ambient. Kinda relaxing and good place for eating and studying at the same time. Very suitable for group of students who can’t just study at home but have to find some dessert place to eat and tutoring. So many students there actually. This place is right in the heart of Bangkok. Delicious Korean dessert,bingsoo and they have self-serve condensed milk on the side that’s a plus. Love Bingsoo here. They are operated 24hr. I came here for first time as late night snack. Oh boy!! That’s a great desserts to cool you down even at night. It’s must!! I would go back for sure if I have chance! First durian trying in my life. The durian is frozen in a nice tasty state without it’s strong flavor. Not too sweet, not too smelly. Really nice try. I had the Premium Mango Cheese Sulbing. Wow it was delicious!! So delicious that i ate the whole thing without thinking about my stomach!! Excellent service and very friendly staff. It is also possible to sit outside and eat. Love this place! Good portion and spacious. Great for meeting friends or for a late night study session. Only downside would be the music that gets a little annoying if you are looking for a nice and quiet place to study at night. A pair of earphones would be a good idea. Other than that, the desert is great, but would not recommend the coffee.